Fifa has set a limit of six substitutes for international friendlies. The rule was forced through at the 2004 annual general meeting of the International Football Association Board (Ifab) in London on Saturday. The golden and silver goal rule is to be scrapped after Euro 2004, meaning knock-out games will again be decided by extra-time and then penalties. Other rules passed include a caution for removing a shirt when celebrating, but half-time will not be extended. Fifa put forward a proposal to extend the maximum time allowed for the half-time break from 15 to 20 minutes but it was rejected. The experiment of advancing free kicks 10 yards following dissent will be extended for another season. A recent innovation in Belgium where a coach communicated with his goalkeeper via a radio link has been outlawed. The use of one-piece kits incorporating shirts and shorts, as worn by Cameroon in the recent African Nations Cup, has also been banned. From next season matches may be played on either natural grass or artificial pitches, according to the rules of the relevant competition and as long as the artificial turf meets Fifa standards. The decision to put a limit on the number of subs in friendly internationals was opposed by England coach Sven-Goran Eriksson. Eriksson, who has changed his entire team during friendlies in the past, had contacted several other international coaches including Italy's Giovanni Trapattoni and France's Jacques Santini to enlist their support. The England coach's decision to make 11 substitutions against Australia last year was met with disapproval by Fifa president Sepp Blatter. But FA Chief Executive Mark Palios accepted the decision: "We supported the position of our coach but we recognise the democracy of the meeting and that our views did not prevail," he said. Fifa's submission to the Ifab said: "The practice of making large numbers of substitutions in friendly matches devalues the game and creates a farcical situation. 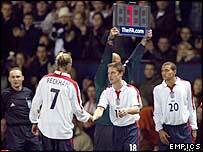 "The number of substitutes used in friendly matches must be controlled." Fifa wanted to impose a maximum of five substitutes but agreed to compromise on the rule. The England, Scotland, Wales and Northern Ireland FAs all have a voting place on the Ifab with Fifa also having four votes. Any rule change needed at least six of the eight votes to become law.